Just returned from a killer weekend in Saint Petersburg. Goodness me, that is a city that knows how to party. I was invited by the Royal Danish Consulate General for the opening of the Dreams on Wheels exhibition. 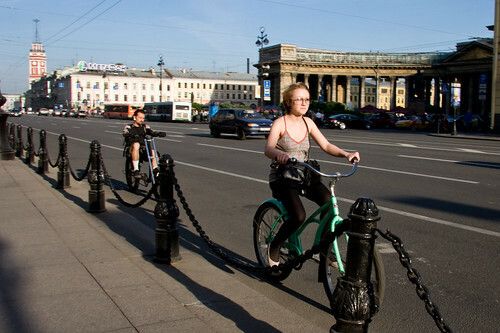 This is the first of a series of three or four posts about St. Petersburg Cycle Chic. 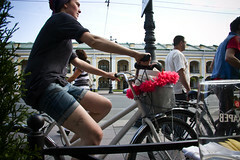 These shots are from the streets of the city, showing the blossoming bicycle culture. 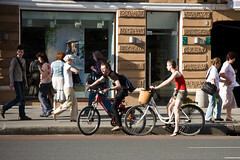 Dottie, from Let's Go Ride a Bike, let me know that Trisha was there last year and we were interested to see if there is an increase in the number of bicycles in the city. By all accounts, things are heading in the right direction. And then some. Four bicycles all at once! Wonderful to see. I saw many more bikes than I was expecting and certainly more upright bikes than I would have hoped. 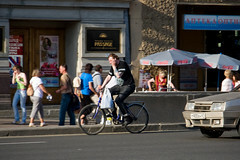 Choppers and BMX's are quite popular in Russia and the mountain bike, dwindling in numbers among urban cyclists in the rest of the world, lives on in Eastern European and Russian cities. Simply because there is a lack of choice at bike shops, from what the locals tell me in every city in the region. There is no bicycle infrastructure to speak of. I certainly never saw any on the streets. 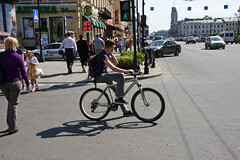 There were many bicycles in the traffic and many rolled casually along the sidewalks at a pedestrian pace. Cool cat from a Reggae Bicycle Club. 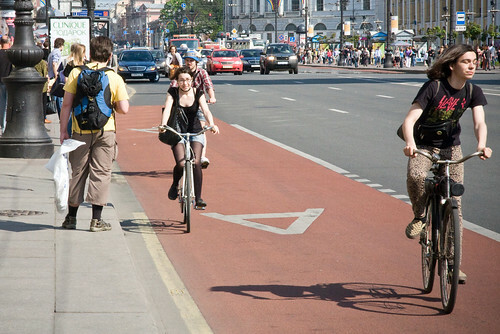 Nordic countries (by we I mean estonians), there are no bicycle lanes. that cannot be said about helsinki, copenhagen or any other developed city. that really makes me want to live in one of those. 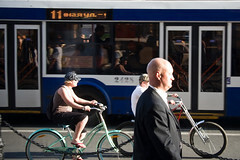 if there were bicycle lanes, there would be a lot more cyclists, the air would be cleaner and life better. :) I don't know how, but please help us get the lanes. don't feel too bad, Maarja. believe it or not, Estonia and most other Nordic countries are far, far ahead of the u.s. when it comes to dedicated cycling infrastructure. when i read articles like these, i often find myself asking "when will we (americans) ever learn? Europe is paradise for cyclists, and like you, i dream of living in a great bike-friendly city like Amsterdam or Copenhagen. i just wish that they had some mountains to climb! organize your cycling community and take back the streets. we have been successful here with some significant victories, but at the same time we often experience some setbacks as well. 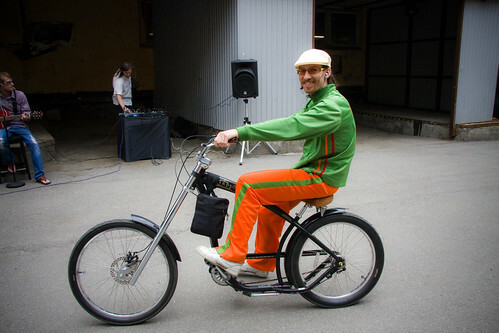 don't give up... i know that things can change for the better- both in Estonia and here in the u.s.
OMG - the guy in orange and green is so cute! As are the other muscled/tattooed hotties. Thanks for sharing these beauties from your trip! Hope you enjoyed the vodka. Finally some cycle chic from Portugal. It´s in Azores by the way...which is very hilly so was a (pleasant) surprise watch this...let´s change some minds! geez... *the number of persons!